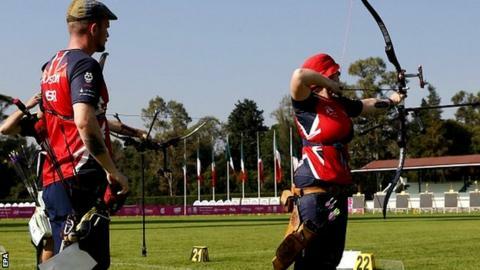 Great Britain's Patrick Huston and Naomi Folkard won the bronze medal in the recurve mixed team event at the World Archery Championships in Mexico. Belfast's Huston and Folkard, from Leamington Spa, only just reached the knockout stages by finishing 15th in the qualification series. However, they then beat second seeds Taipei and Mexico en route to the semi-finals before losing to Germany. The British duo overcame Japan 5-3 in Sunday's bronze medal play-off. Korea took the gold by beating Germany in the final. Huston, 21, reached the last 16 in his individual event earlier in the championships. The Belfast man qualified for last year's Rio Olympics while Folkard, 34, has competed in four Olympic Games.